A slice ‘n’ dice treatment on the first two Lone Wolf & Cub movies from the early 1970s, this is a commercially aesthetic international re-edit and, therefore, the most widely viewed instalment. You’ve probably seen this movie without even knowing. The narrative is messy but as a spectacle it works just fine. The film centres on the iconic cinematic image of Lone Wolf, a lethal Samurai assassin, who roams ninja-infested terrain with Cub, his three year old son who is cased inside a lethal push chair rigged to the hilt with booby traps. The premise is both savage and heartfelt. Lone Wolf’s unbridled affection for his son forms a great contrast with the way he violently dismembers hoards of blade wielding baddies. Lone Wolf mainly focuses his decapitation skills on a sprightly bunch of deadly lady ninjas and the superbly titled Masters of Death, resulting in blood, gore, and much of the same. The deaths are extravagant but stylish. 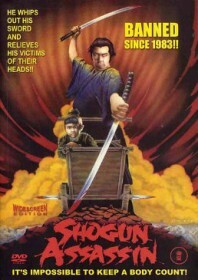 It’s Kurosawa on a serial rampage, but with a kid in a pram, obviously. Studio: Katsu Productions, Toho Film Co.